right bin for the job! Ministry of the Environment approved and insured, King Recycling & Waste Disposal specializes in providing Toronto with waste disposal bins for residential, commercial, industrial, and construction needs. 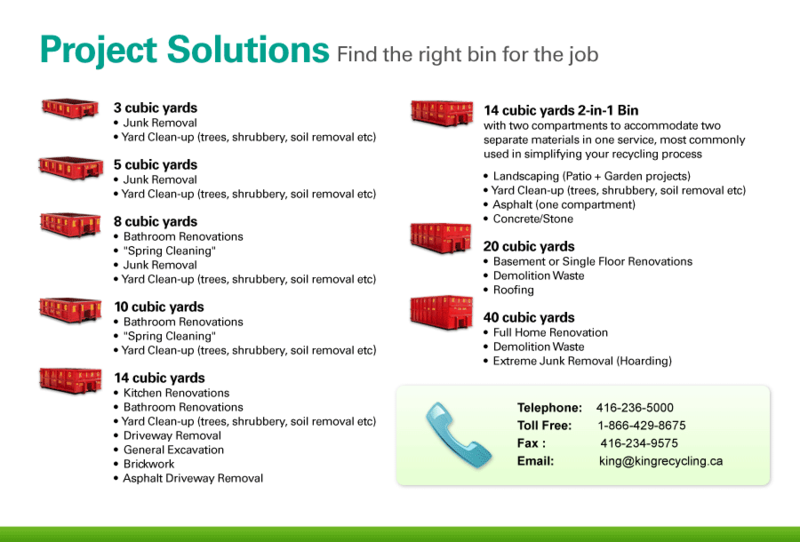 King Recycling & Waste Disposal services the Greater Toronto and surrounding Areas with garbage removal. We are pleased to note, we will travel to any part of the surrounding areas to provide you with the best of service. So when you need waste or junk removal in Brampton, Mississauga or other outlining Toronto cities, King Recycling & Waste Disposal should be your first call. to identify the bin-size your particular project requires! Call or email us today to book your service.